The FANCL Foaming Net creates a generous amount of rich, creamy cleansing foam in just seconds – twice as much as with bare hands alone, using the same amount of product. New innovative cleansing powder turns into a rich, dense foam more quickly and easily by adding water. It gently lifts off dirt and impurities and even diminishes clogged pores without irritating the skin. It also preps the skin for maximum absorption of treatments, serums and moisturizers that follow after cleansing. Terms: No promo code necessary. Limited quantities are available and are distributed on a first come, first serve basis. Promotion is valid while supplies last. Promotion is only valid on fancl.com. Not valid on previous purchases. We reserve the right to substitute any free item offered with an item of equal or greater value. Expedited shipping options are not available for this promotion. 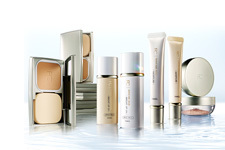 Customers must return ALL ITEMS included in GWP if they return any purchases made using the promotion. No exceptions. All shipping fees associated with returning GWPs are customers’ responsibility unless product is clearly defective. Limit one Foaming net per purchase. We reserve the right to cancel any order due to unauthorized, altered, or ineligible use of offer and to modify or cancel this promotion due to system error or unforeseen problems.